Merry Christmas from Your No.1 Goodguys! It’s that time of year already! Once again, we’ve put our thinking caps on and come up with a unique Christmas card which has been designed by our own Marketing Goodguy, Nathan, to send out to our clients and contacts. 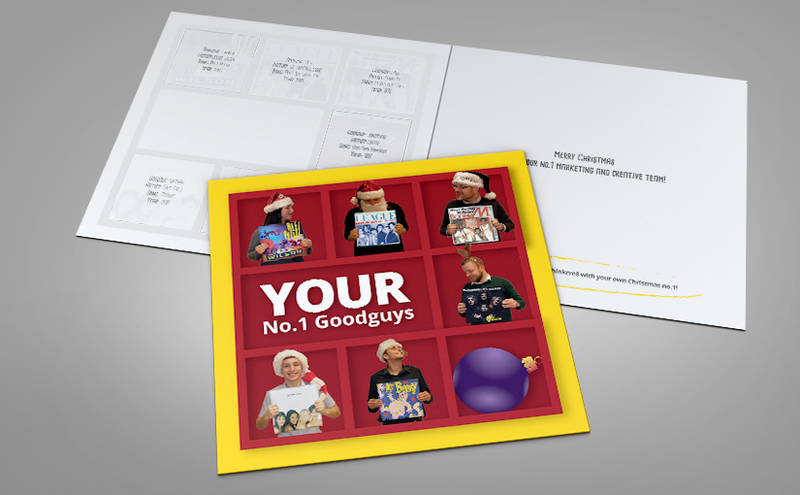 Our theme this year was ‘No.1 Goodguys’, and the cards feature our Marketing Goodguys with the Christmas number one records from the year we were born. After quite a lot of brainstorming and teamwork (and everyone taking the credit), we all chose the final concept. We wanted to feature something which relates to Christmas but is also personal to every one of us, making the Christmas card very unique and portraying our business’ friendly – and creative – approach, not to mention our love of cheesy tunes. Nathan decided on the final design, with each of us holding our own record and ‘interacting’ with the others. Nathan put his design and idea into practice, using Adobe Illustrator to produce the layout of the design. Then, he plugged in the colours which represent Christmas and CRE8’s house style. Next, he put his photography skills to the test by taking photographs of us all wearing very festive attire which were then isolated and added onto the Christmas card design. Finally, after a few minor alterations, the cards were ready for a high-quality print. Not only have we designed and printed the Christmas card designs for our own business, but for others as well! You can see on our portfolio some of our other Christmas cards that we have produced for clients. Previous PostPrevious CRE8ive thoughts for CRE8ive people! Next PostNext Jordan delivers some Christmas cheer!